It’s been so long I’ve been willing to get a Credit/Debit Card to shop online and pay for some of my online services but I couldn’t get one due to the fact that I do not have the required means of Identification, but few weeks ago I succeeded in getting a Debit Card so I will like to share with you ‘How I obtained my Debit MasterCard easily here in Nigeria and How I activated it ’. Sit right and continue reading this post in order to get yourself a Debit MasterCard. The Debit Card I obtained is a Naira Debit MasterCard and it was issued to me by GuarantyTrust Bank (GTBank). I visited a GTBank Branch at Bodija, Ibadan and I asked for the process on how to get a Naira Debit MasterCard so they told me I will have to open an account with them either Savings or Current Account then I decided to go for Savings account since I don’t have a lot of money to run a current account, LoL. GTBank required the following before you can open a Savings account with them; International Passport, Driver’s License, Voter’s Card or National ID card and a PHCN Bill not more than 3 months old to verify you are truly a resident of the address you are using to open the account. But note that I don’t have any of the Identification means above so I used my Work I.D Card since I work in a highly recognized international institute which means that if you work in a well-recognized company, your work ID card will be accepted as an alternative to those mentioned earlier on. After filling the necessary forms and signing the documents, you will receive an email or SMS confirming your new Savings account with GTBank although you will have to pay at least N1,050 minimum to open up this new account and the N1,050 will be deducted later in order to process your Naira MasterCard. Two weeks later, you can now go for your New GTB Naira Debit MasterCard. When you get to the bank this time around, you will be given a sealed envelope containing your New GTB Naira Debit MasterCard with some usage instructions and even a letter with your attached PIN number. 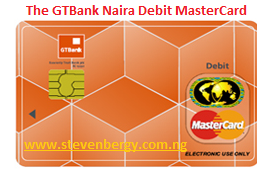 NOTE: The GTB Naira Debit MasterCard is also your ATM Card (It is not different as you can see in the picture). It serves two purposes; 1. ATM Card – to withdraw cash from ATMs. 2. Debit Card – to pay for goods and services online. Thank God, you’ve successfully collected your New GTB Naira Debit MasterCard. Now you can go home and relax as you wait for my next post on ‘How to activate and start using your new GTB Naira Debit MasterCard’. Do you have any question, suggestion or contribution which you will like to share with us? Kindly make use of the comment box provided below, we will be glad to hear from you? And don’t forget to share this useful piece of information with your friends. Hope this helps, See you soon!! !